I’ve already written two blogs covering some of the FAQ’s about strobes that I get from emails, Facebook and in person (to read them click here for my first strobe blog and here for the second), but so far I’ve not addressed one of the big questions. Which are better strobes or video lights? In this blog I am going to explain how using these different light sources impacts on your underwater photography and look at when you would use one or the other. I’ll also try and give some advice on how to set your camera when using a constant light source rather than a flash. What is the difference between a strobe and video light? A waterproof strobe functions like a conventional camera flash giving a powerful, short burst of light. This light is so strong and brief that it can freeze the movement of the subject lit by it in a picture. All but the most powerful video lights cannot match the output of even a relatively small strobe. This combined with the fact that video lights give constant illumination means they can't freeze movement in the same way that a flash does. Before I moved over to using strobes i had a Canon S95 and a 600 Lumen video light, which is what this shot was taken with. Nowadays that output is quite tiny for a video light. When I moved to using a strobe it felt like a huge step up particularly because it was much easier to get sharp images of more active marine life than this nudibranch. As well as not being able to freeze movement in a shot, using a constant light creates other issues that you don’t encounter with strobes. Marine life tends to react more to video lights than flashes. From my experience using constant lights and diving with other people who have them, creatures will often turn away from them and sometimes move to get out of their area of effect completely. Animals will tolerate flash much better and usually don’t react at all. This may stem not just from the light itself but also the heat generated by powerful video lights. How should I set my Camera when using Video lights? Because they don’t freeze movement in images you have to use the camera's shutter speed to deal with motion in your shot. Unlike with flash, shutter speed will affect the exposure of all elements of the shot not just the background when you use a constant light source. Basically the same as if shooting with natural light except you are replacing lost light so at depth you’ll still have colours that would normally be absent. This is me with the rig I took the nudibranch image with. Anne took this picture using the same model camera as I am using but with available light and custom white balance. I wasn’t using the light when this was taken which will be clear later in this blog. If you are taking pictures of moving creatures you’ll need to increase shutter speed on your camera to reduce the likelihood of motion blur. This in turn will reduce the exposure of your images so you may find you need to open the aperture (reduce f number) or increase the ISO somewhat. For more on manual camera settings go to my previous blog here. For people shooting with cameras that don’t give you full manual control, such as the Olympus TG5 increasing aperture and ISO will cause the camera to increase shutter speed to some degree. as will reducing the exposure compensation setting, but being able to adjust shutter speed yourself wouldl give you more control. If you are shooting RAW and editing afterwards then you can afford to underexpose somewhat as you can correct it afterwards (see my blog on shooting RAW here for examples). Those folk taking jpegs will have less scope to increase shutter speed. I’d also suggest you try different white balancing options if shooting jpegs. You may find that the light temperature from your video lights doesn’t give the tones you want when using auto white balance and you may have to use an artificial light setting or even custom white balance to get the colours the way you want. Which is better strobe or video light? When asked by customers about video lights for underwater the question I ask is ‘how much video do you shoot?’ If the answer is more than 50% then a video light is a good option. The clue is in the name video lights are what you need for video when you haven’t got enough available light. At night, at depth or in an overhead environment you are going to need a constant light source to see what you are doing whether you are using flash or not. This shot was taken using the same Canon S95 and video light as the nudibranch but in this case the sun had gone down and the only light source was the one I carried. For still underwater photography I’d always recommend a strobe over a video light. As much because of its impact on marine life and other divers as the issue with background exposure control in your pictures. I find diving in a group with some people using high powered lights can be unpleasant. Dives become a race to reach the interesting marine life before it flees from the blazing lamps of your fellow divers and when light levels are low you can find yourself dazzled by carelessly aimed beams. Constant lighting does however offer some fun, creative options particularly in macro photography with coloured and/or snooted lights being made by a number of manufacturers. They can also be a less costly and easier to set up choice when doing off camera lighting. I often suggest to customers that they get a focusing light with an auto flash off function. These can be used as a light source for macro photography (beam widths are usually too narrow for wide angle) or when using flash to light your shots you can use it as an aid for the camera to focus and to see what you are doing when ambient light is low. The BigBlue AL1100RAFO is an 1100 lumen focusing light with a 55° beam angle. While it can be used as a light source for photography or video its primary use is to help the camera to focus (who would’ve guessed) when light levels are low. A sensor in the light turns it off when a flash fires near to it, so it does not cause uneven lighting or backscatter in your images. But overall I’d suggest waiting until you’ve got the cash to buy a strobe if you are looking for a complete lighting solution for all types of still photography underwater. There are a number of systems that can produce constant light for video and also a flash. Some use separate LED’s for constant light combined with conventional flash system while others use LED’s for both. The LED only systems do seem to be becoming more common and we did have a play with the latest offering from Scubalamp although only on dry land a few weeks ago. What I would say is that these systems aren’t yet a substitue for a conventional strobe as the flash duration is quite long. This means you still tend to need to use shutter speed to control the exposure and movement in your picture. What they are good for is videographers who want to take some stills and find that some creatures will shy away from their lights. With this type of system you can approach with your lights off, set low or giving a red light and then use the flash function to take your pictures. This will minimise the impact on critters that don’t tolerate video lights being shone on them. In this shot taken by Anne using available light and custom white balance you can see another of the issues that using video lights can cause. 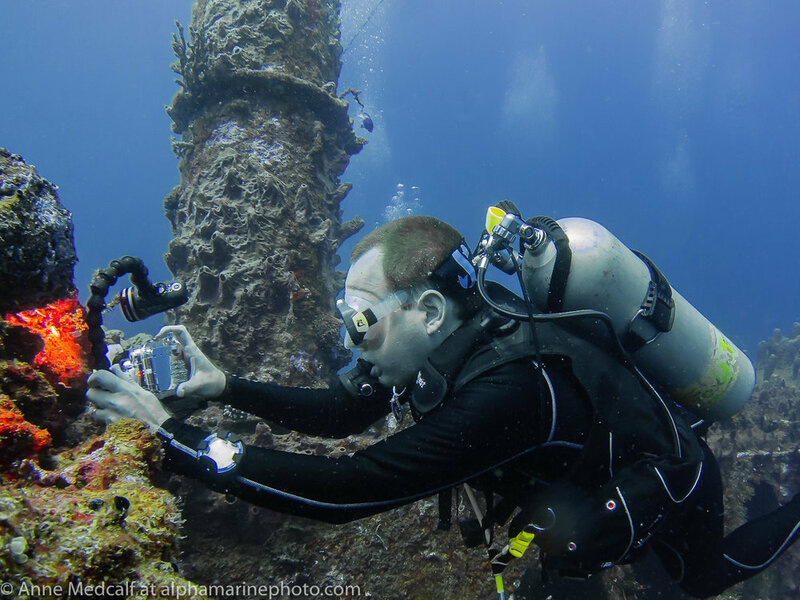 While it doesn’t impact on the user, for other underwater photographers not using artificial lighting in their shots having unsightly red patches appear in their pictures may not be desirable. This was quite deep for using available light so there is still a bit of blue tint in the image. I’ve not talked about what to look for when buying a video light as yet. I’m going to leave that for a future blog but I will say here that coverage is vital. If you have any questions or comments feel free to use the comments box. Anyone with an interest in photography is welcome to join the Alphamarine Photography Q and A﻿ Facebook group. Or if you want advice about anything underwater photography related email us at info@alphamarinephoto.com Do the same if you'd like any information about the courses, talks and workshops we run or the equipment we sell.